AKRON — Lima’s Audrey Crites finished among the top nine by reaching the semifinals in the Stock Division of Wednesday’s AAA Local Challenge competition as part of the All-American Soap Box Derby World Championships. The 10-year-old, who won the Stock title at the Lima derby and will be entering the fifth grade at Waynesfield-Goshen, defeated two competitors in the first two heats and another in the third before finishing second by .026 of a second to eventual champion Aidy Driggers from Southeast Georgia. Lima derby champs Emily Skinner (Masters) and Laiken Eith (Super Stock) finished second and third respectively in their opening round races. Crites, Eith and Skinner are scheduled to compete Saturday in the derby championships. BLUFFTON — The team of Erin and Mary Kelly Mulcahy combined for a 10-under 62 to win the girls 16-18 division in Thursday’s Lima Junior Golf Association - McDonald’s Series First Federal two-player scramble at Bluffton Golf Club. Meghan Mulcahy and Hayley Wurm finished second with a 69. Aaron Belcher and Keaton McKinley were the boys 16-18 winners with a 63 followed by Jared Hernandez and Tanner Sweede with a 65. Louis and Joseph Magoto won the boys 14-15 competition with a 73. Calvin Caywood and Reese Sweigart were second with a 74. In the par 36 nine-hole events, Chase Beery and Parker Jeyd won the boys 12-13 event with a 33 followed by Max Cotner and Aiden Wehrman with a 38. Bridget Mulcahy and Eva Bolin shot 40 for the low score in the girls 15 and younger division. Carlie VanMeter and Emma Mayers were second, scoring a 44. Brevin Brandt and Sullivan Hasting were the peewee (11 and younger) champs with a 31. Kallie McKinley and Connor Nartker finished second with a 36. 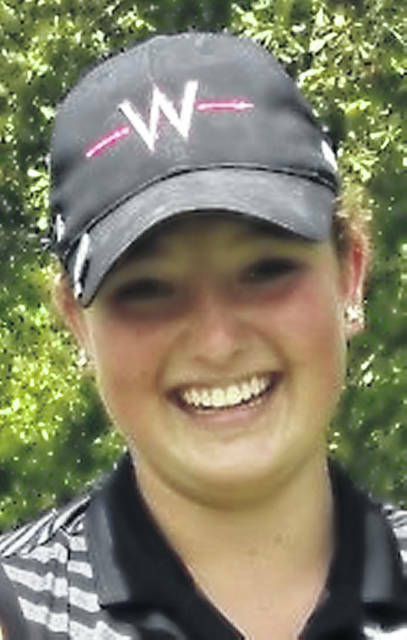 Wapakoneta’s Taylor West recorded a hole in one on the 300-plus-yard par 4 sixth hole. The next LJGA event will be Tuesday at Shelby Oaks Golf Club. For more information go to tinyurl.com/LimaJuniors. FLAT ROCK, Mich. — The Lima Locos held for a 5-4 Great Lakes Summer Collegiate League victory Thursday night after allowing host Lake Erie to score two times in the bottom of the ninth. The Locos scored one in the first, twice in the seventh to get a 3-2 lead and then added a pair of runs in the top of the ninth. Jaxon Shirley (Oklahoma) had three hits, including a double, Daniel Seres (Kennesaw State) had two hits and an RBI and John Privitera (Missouri State) had a pair of hits for Lima. Tyler Simon (Kennesaw State) also doubled for the Locos. Tyler Miller (Texas A&M Corpus Christi) got the victory, allowing one earned run, four hits and two walks while striking out 10 in seven innings. Jordan Marks (South Carolina Upstate) got the save. The Locos (21-11) will play the Monarchs at Flat Rock Field against at 8:05 tonight and will return home for a Saturday doubleheader against Irish Hills beginning at 5:05 p.m. at Simmons Field. Travis Downing, Ashland University defensive back and Kenton High School alum, was recently announced as a nominee for the2018 Allstate AFCA Good Works Team for making a significant impact on his community through his volunteer accomplishments. Downing is one of the 169 college football players from across the country that were nominated this year for their “good works” off the field. From the 169 nominees, a final roster of 22 award recipients, comprised of 11 players from the NCAA Football Bowl Subdivision and 11 players from the NCAA Football Championship Subdivision, Divisions II, III and the NAIA (and one honorary head coach), will be unveiled in September. Today, area drivers Claire and Chassidy Oatman and Riley Iiames will be competing as part of the National Super Kids Classic, which pairs them with physically and mentally challenged children from around the world. WAYNESFIELD — After sitting silent last weekend, Waynesfield Raceway Park will come alive with four divisions of racing Saturday night. The program will be headlined by the Quest Federal Credit Union Non Wing sprints who will take part in the second “Double Down” night of the 2018 season. The Non Wing sprints will run back-to-back nights starting at Limaland Motorsports Park in Lima and ending Saturday at Waynesfield. The sprint cars will be joined by the Satellite Connections UMP Modifieds, Block Insurance Tough Trucks and Indian Lake Outfitter Compacts. The night of racing is presented by the Block Insurance Agency. Adult general admission is $12. Those ages 11-15 are $6 with everyone under the age of 10 admitted for free. Pit access is $25. Pit side gates open at 4 p.m. and grandstands at 5 p.m.. Hot laps get under way at 6 p.m. with the first green flag at 7 p.m. Head to waynesfieldracewaypark.net for more information. LIMA — Limaland Motorsports Park will be holding UNOH 21st Anniversary Night and the Keysor Memorial tonight. Non-Wing Sprints, K&N Filter Modifieds and Bud Thunderstocks are scheduled to compete. Grandstand gates open at 5 p.m. and pit gates at 4:30 p.m. Warmups start at 6:30 p.m. and racing at 7:30 p.m. Adult admission is $12 with youngsters 11-15 getting in for $6. Those 10 and younger get in for free. Pit passes are $25. Go to limaland.com for more information. This entry was tagged Locos. Bookmark the permalink.